EpoxAmite® 103 is an easy-to-use liquid epoxy system formulated for a wide variety of fabrication applications. 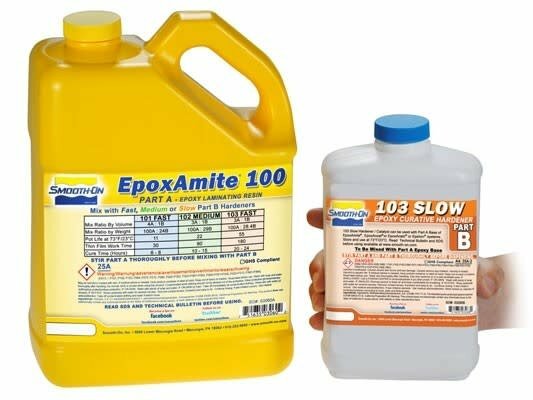 EpoxAmite® 103 includes the EpoxAmite® 100 Base and the EpoxAmite® 103 SLOW Hardener. 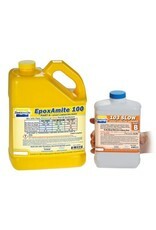 EpoxAmite® 103 is unfilled, low in viscosity, odorless and cures at room temperature. Cured epoxy displays exceptional physical and performance properties. It can be sanded, shaped, machined, drilled, tapped and painted. EpoxAmite® 103 can be used with reinforcements such as S-Glass, E-Glass, Kevlar and Carbon fibers for lay-up applications or composite parts. EpoxAmite® 101 can also be mixed with fillers such as fumed silica for gel coat applications. Urefil® 3, Urefil® 7 and other fillers can be added for fairing, filleting or bonding applications.